The Hate U Give meets All American Boys in this striking and heartbreaking debut novel, commenting on current race relations in America.When Marvin Johnson's twin, Tyler, goes to a party, Marvin decides to tag along to keep an eye on his brother. But what starts as harmless fun turns into a shooting, followed by a police raid.The next day, Tyler has gone missing, and it's up to Marvin to find him. But when Tyler is found dead, a video leaked online tells an even more chilling story: Tyler has been shot and killed by a police officer. Terrified as his mother unravels and mourning a brother who is now a hashtag, Marvin must learn what justice and freedom really mean.Tyler Johnson Was Here is a stunning account of police brutality in modern America. Tyler Johnson Was Here by Jay Coles hit my radar via Twitter, I think when everyone was tweeting out the cover. FYI, that cover is PERFECT. Like, how could it not catch your eye immediately? So, I knew I had to read this book. Also, I am trying to learn more about the Black Lives Matter Movement via fiction and non-fiction. Frankly, this book with the most gorgeous cover really made me think and also check my reactions. Here are the biases and perspectives I bring to the table while reading this book, so that we have full transparency. I am white. I live in the suburbs. My husband is a police officer as well as a commissioned officer in the military. Our social group consists of other officers – both military and police. I do not come into this book with negative connotations of BLM. However, I did come into it with my background of positive experiences with law enforcement. I want to stress that I am a white lady reviewing this book and my perspective is basically irrelevant, but I am obligated to review this book as I obtained it from Netgalley. Jay Coles’s Tyler Johnson Was Here is about this teenager named Marvin who has a twin named Tyler. Marvin is kind of a nerd, but actually really awesome. I mean, he and his friends are really into this TV show. My name blanks on it right now. Anyways, so Marvin has these big dreams. He wants to go to MIT and major in engineering. Only his principal is a total douche and tries to prevent Marvin from achieving this dream. Meanwhile, Marvin’s brother is kind of drifting from him. He’s hanging out with this guy named Johntae who is not really a savory character. One night, Marvin and his two friends go to a party along with Tyler. The party gets busted. Marvin and Tyler get separated and that is the last Marvin sees of Tyler. And so, the book grapples with where it is that Tyler went. Of course, we all know what happened because it is on the jacket copy. Marvin’s journey is SO interesting. I mean, he has a lot to grapple with. He’s thinking about his father who is in prison for a crime he didn’t commit. He’s worrying about his brother. Also, Marvin is trying to decide if he is making the right choices for his future. For awhile, MIT seemed like the best choice. Yet, is that because it is a white school and we value white things more? There’s this shift in Marvin as a person when he begins to think about Howard and sets his sights on that school. There’s a lot to unpack and think about and discuss. 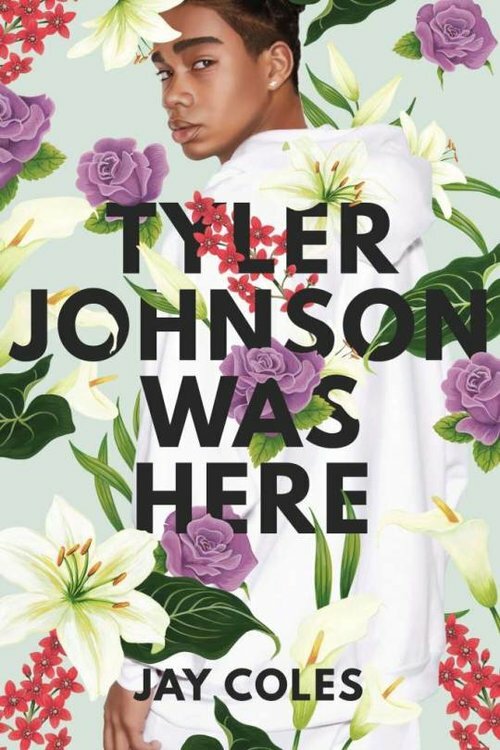 I feel like Tyler Johnson Was Here really adds something unique and new to books that examine the lived experiences of Black teenagers. Straight up, this book caused me to really have to do the work of examining my biases and my perceptions. There were times I was reading it and could feel myself kind of pushing back a little with regards to the antagonism of law enforcement and the principal. I remember thinking, wow, that is a bit much. Then I had to stop and say to myself, no. No, this is my ingrained racism and just because I have had positive experiences, does not mean that is the reality of Black people. I think if you’re reading this book and you are white, you’re going to find yourself doing the work. By that I mean, you will examine your biases. You will question your perceptions. This is absolutely a book that will make you think and is well worth your time.